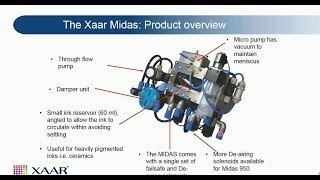 The Xaar Midas Ink Supply System - A compact fluid supply system. Ease of integration is a key advantage of the Xaar Midas Ink Supply System. It is compact and light, easy to mount and has a small ink tank capacity. This is a flexible solution with a modular design which makes it suitable for a range of applications; it can run multiple printheads out of the box as standard. Available in three variants, the Xaar Midas Ink Supply System is suitable for single or multiple printhead configurations. In addition, it is fully compatible with the Xaar 501, Xaar 502, Xaar 1003 family, Xaar 2001 and Xaar 2001+ printheads – all of which incorporate Xaar’s unique TF Technology ink recirculation. The new Xaar Midas Ink Supply System is a compact fluid supply system for OEMs looking for a fast time-to-market and therefore low development costs. Robust and easy to integrate, it is ideal for full production as well as prototype systems. Consistent high print quality in single-pass and scanning modes is ensured by the integrated hydraulic meniscus measurement system. The system automatically compensates the meniscus pressure within the printhead as fluid levels inside the integrated fluid reservoir change during usage. Xaar Midas communication pack: USB to RS422 communication gateway adapter. Xaar Midas 950 line connection: set of one failsafe and one de-airing solenoids. The Xaar Midas 450 offers up to 450 ml/min recirculation flow rates needing only a 60 ml ink reservoir. This is ideal for advanced manufacturing, direct-to-shape and other applications jetting expensive fluids. The Xaar Midas 950C and 950X have a fluid flow rate of up to 950 ml/min with a 150 ml ink reservoir, targeting high volume and high throughput printing.